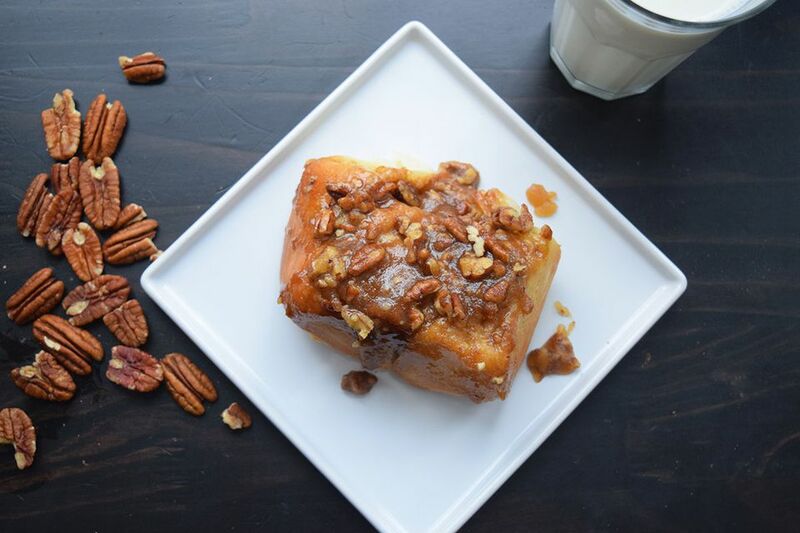 If you thought cinnamon rolls couldn't get any better than you haven't met the sweet, sticky, gooey, fluffy deliciousness that is a caramel pecan roll. The recipe for the dough is the same as it is for my cinnamon roll recipe, but instead of topping with an icing, you bake them upside down in a caramel concoction. When the rolls come hot out of the oven, you flip the pan over like an upside down cake and the amazing caramel topping drizzles down over the sides of the rolls. It's basically heaven. This recipe is a little time consuming due to all the rising that has to happen. But they are simple to make and are definitely worth the wait! If you really don't want to wait you can always just throw some pecans onto this cinnamon roll cream of wheat recipe. This recipe makes a giant batch of rolls. It's great to make them for holidays or to bring to someone who needs a little something special! You can easily half or quarter the recipe if you want to make fewer rolls. They are also really easy to freeze, just bake half way, let cool, and cover with tightly with aluminum foil. You can keep them frozen for 3 months! Just take them out and bake them for about 45 minutes, until they are soft, fluffy, and golden brown! Don't forget they taste great served alongside bacon! Heat the milk, butter and sugar in a saucepan over medium heat. Make sure to just let it simmer and not boil. Remove from the heat and let it cool to lukewarm. Roll out one piece at a time into a large rectangle. Leave it relatively thick, about 1/4-1/2 of an inch. Combine 1 1/2 cups of the softened butter with 1 3/4 cups of brown sugar, 1/4 cup of cinnamon, 1 cup of the pecans, and 1/2 teaspoon of cloves. Spread one third of this mixture over the rectangle of dough. Combine the remaining softened butter with the remaining brown sugar and chopped pecans. Split this mixture up evenly between your baking dishes (how many you use depends on the size of your pan). Place the sliced rolls in the baking dish so that they are not touching. They will rise quite a bit! Cover the cinnamon rolls with a towel. Repeat steps 5-8 for the remaining pieces of dough. Let them rise for about 20 minutes. Flip the pans over onto a serving plate while the rolls are still warm, so the caramel topping will still be soft. Serve immediately! !